Few travelers come to Thailand without a floating market on their minds. The scenes of paddle boats, overflowing with colorful fruits and vegetables, aromatic food and local vendors’ sincere smiles, are authentically Thai and undeniably unforgettable. While the ever-popular Amphawa Floating Market in Samut Songkhram is unmissable, one very authentic floating market beckons peace-craving travelers on the outskirts of Bangkok. As Khun Maitree, our Super Local Expert and winner of TakeMeTour Outstanding Trip Award 2017, believes, what it lacks in size, Khlong Lat Mayom Floating Market makes up for in its variety of things to do and eat. Complete with rural charms you wouldn’t expect to find in Thailand’s capital, Khlong Lat Mayom Floating Market is an easy escape from the hustle and bustle. Coming from a family of orchid farmers in Nonthaburi (Bangkok’s neighbor), Khun Maitree (nicknamed Khun Koh) has been passionate about agriculture ever since he was young. He went on to study agriculture and now works as a researcher for Thailand Institute of Scientific and Technological Research, constantly improving organic agricultural products in Thailand. For almost two years, Khun Maitree has taken on another expert role, this time in local way of life. He discovered TakeMeTour in 2016 and as one of our pioneer Local Experts, Khun Maitree has since been showing travelers the refreshing and relaxing sides of Bangkok. Though he wasn’t born in the neighborhood, Khun Maitree has been living near the decade-old Khlong Lat Mayom Floating Market for years. “I’ve been frequenting the market since when there was still only one zone,” the agricultural researcher told me. 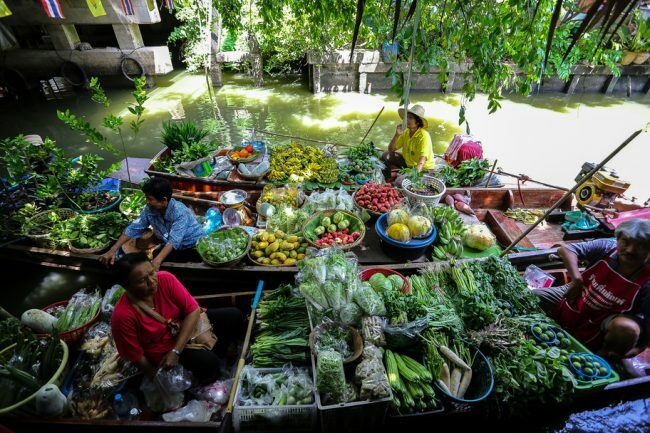 Over the years, Khlong Lat Mayom Floating Market has grown into six zones brimming with handcrafted products, farmfresh produce and mouthwatering food. The amount of things to eat are dizzying, but Khun Maitree will be happy to show you around. He highly recommends the must-eat triad: chicken satay (gai satay), papaya salad (somtum) and grilled fish (pla pao). 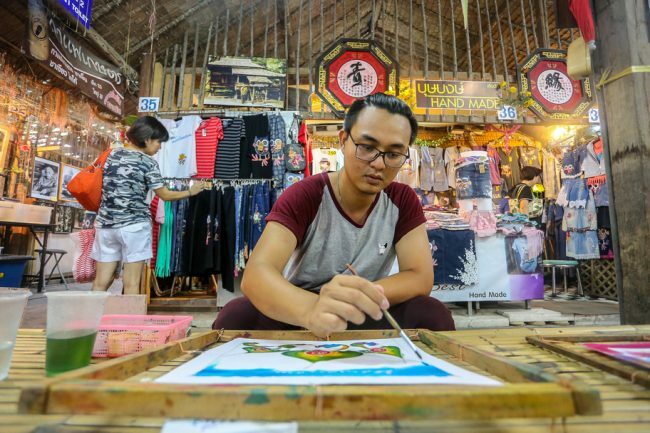 Founded by locals and for locals, Khlong Lat Mayom Floating Market has evolved from a quiet community market into a very lively one. It has been more than ten years and the locals never deviate from their goal of preserving traditional Thai culture and local way of life along the canal. The serene farm scenes and local homes remain intact. While the number of boaters and vendors at Khlong Lat Mayom Floating Market aren’t Thailand’s number one, visitors get a rare chance to hop on a paddle boat or long-tail boat and witness the locals’ simple way of life along the canal. Hoping his guests get to experience both nature and culture along the canal, Khun Maitree takes them on a long-tail boat ride, which covers a longer route. After a spiritual journey at the local Buddhist temple Wat Saphan, he followed up with an enriching stop at Loong Niyom’s Orchid Farm (loong means uncle). From his personal meetings with Uncle Niyom before creating the trip and his own history and expertise, no one’s better to take you around this 40 year-old orchid farm. My mind drifts to Khlong Lat Mayom Floating Market’s banners that I saw while traversing the canal. “Connecting people to nature” they read. A reminder of the importance of klong or canals in the days when few roads existed and how Khlong Lat Mayom Floating Market links people and local life amid nature together. I believe Khun Maitree’s works as both agricultural scientist and Local Expert are like canals that connect people and nature as well as visitors and locals together. 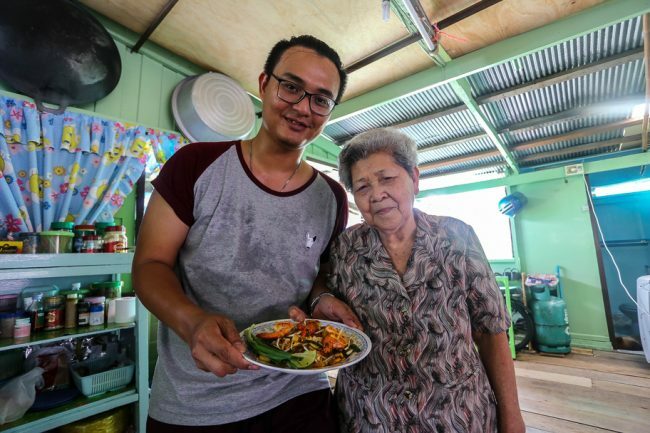 While Khlong Lat Mayom Floating Market is already a very local experience, Khun Maitree goes above and beyond for his guests by offering the opportunity to experience the local way of life with his family. 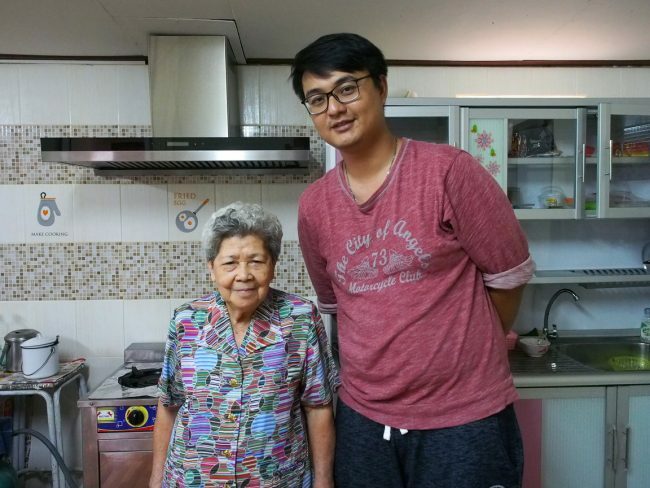 Cordially inviting travelers from around the world to his home for Pad Thai cooking class, Khun Maitree revealed that the instructor is none other than Grandma, or Amah if you want to use the Thai-Chinese word as Khun Maitree’s family does. In the end, Khun Maitree and Amah chose Pad Thai. It might come as a surprise that this signature dish is considered an easy dish, but with Amah’s good instruction in Thai, Khun Maitree’s interpretation and their well-prepared ingredients (including their homemade Pad Thai sauce), everyone is guaranteed their own delicious dish of Pad Thai topped with a lot of happiness. Amah is a lovely and soft-spoken woman who has always loved cooking. Her day begins at around 3am, waking up to cook for everyone in her family. From breakfast to lunch to dinner, Amah’s home-cooked meals are a source of the family’s happiness. 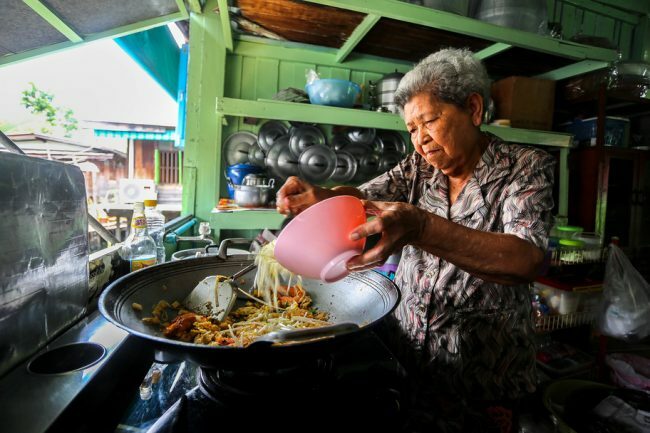 “Her set of cooking utensils is so extensive that some guests wondered if they were in a restaurant,” Khun Maitree laughed while sharing the memory. But this is no restaurant. Each time Amah cooks, it’s about instinct and improvisation and a blend between Thai and Chinese cooking. No dish is the exact same. The same goes for her Pad Thai. “It’s something that we cook and eat together in our family,” Amah explained. While how she cooks isn’t set in stone, one thing is for sure: the warmth Amah puts into each and every one of her tasty homemade dishes. The Pad Thai cooking class with Khun Maitree and Amah isn’t the end of the local experience. As you join Khun Maitree for lunch on the very same table he dines with his family, Khun Maitree also serves up local stories. Maitree. This Thai word has a beautiful meaning: cordiality. A very fitting name for Khun Maitree, whose words, actions and heart have proven from start to finish that he truly lives up to his name. This month’s Meet the Local Expert features Khun Maitree (khun is a Thai honorific added before a name). Meet and discover a local side of Thailand with him here.